Our circuits class (Wheel-Agility™) is a great way to improve general fitness by performing a variety of exercises in sequence that cover strength, endurance and cardio work. The circuits are designed to push you that little bit further and help you to improve your mobility, endurance, strength and co-­ordination for everyday life. 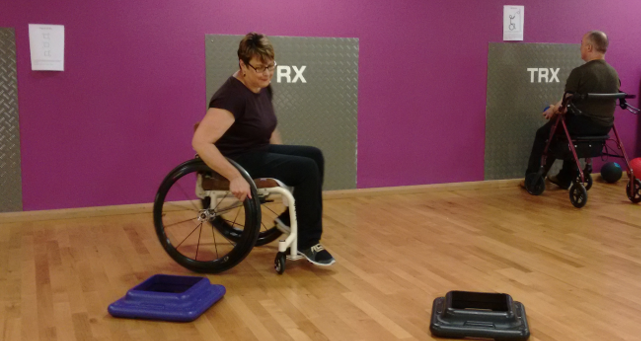 Our circuits are intended for self-­propelling wheelchair and ambulant clients, encouraging and motivating you to work hard, help you to burn calories, and improve your abilities and cardiovascular function whilst having fun and socialising. The session begins with a warm-up to ensure your body is ready for exercise and to elevate the heart rate before starting the main session. During the class you will be involved in a combination of individual and group work with a little bit of competition and fun thrown in, making it varied and interesting. Many of the exercises are based around daily functions to help improve these abilities whilst also improving your overall fitness. Before finishing you will be taken through a range of stretches to help improve your flexibility with the potential of increasing your range of movement over time. You can take part in the class in your ordinary self-­propelling wheelchair, you do not need a special ‘sports’ chair to take part in the class, nor do you need to be a wheelchair user. Clothing should be suitable and comfortable for exercise. Please bring water and a towel with you and any straps etc if you use them. All participants are required to complete a brief PARQ (Physical Activity Readiness Questionnaire) to confirm that there are no medical reasons why they cannot safely take part in this and other classes before beginning. As this is a disciplined and fast moving class, where a client is supported by an enabler, carer or PA the person supporting is required to remain with their client throughout to ensure they are able to follow any instructions given, access any required equipment as instructed and be able to take on refreshments as required, ensuring the client is able to work as independently and safely as possible throughout the class. To request a place on one of our classes, please select the date you wish to attend on the calendar below and complete the booking form. Payment is made on the day to the instructor.